Microsoft chairman and Chief Software Architect Bill Gates announced in a press conference Thursday afternoon that he would be shifting priorities, leaving his full-time position at Microsoft in two years to focus his efforts on the Bill & Melinda Gates Foundation. Gates reitered that he is not retiring from the software business, calling the change a re-ordering of priorities. "With greath wealth comes great responsibility," he said. "A responsibility to give back to society." Gates will retain his position as company chairman, and plans to spend some of his time at Microsoft. "I want to spend more time on foundation efforts in the future," Gates explained. "After careful consideration, Steve and I have agreed to announce a two year transition plan...We have a great team of people and I believe we can make this transition." Microsoft's Craig Mundie will become Chief Research and Strategy Officer, and will assume Gates' role with Microsoft Research. "Craig will also manage Microsoft's intellectual property and policy issues," Gates said. "Obviously this decision was very hard for me to make....Even as I prepare to shift my focus in July 2008, I know Microsoft is well positioned for success in the years ahead." Gates said that he will "miss working for Steve every day as I have over the past 26 years." 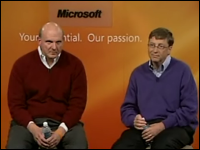 "Bill may reduce his time here but his imprint on the company will never diminish," said Microsoft CEO Steve Ballmer. "We will continue his tradition of thinking big and executing even bigger." In the near term, Gates will be taking a 7 week vacation -- the longest he says he has been away from Microsoft -- in Africa and "enjoying the Seattle summer." Ballmer noted the vacation was earned long ago, and is unrelated to the career transition announcement.